Sen. Edward Kennedy, who is battling brain cancer, is urging Massachusetts officials to change a law to allow for an immediate temporary replacement should a vacancy occur for one of his state’s two Senate seats. Under a 2004 Massachusetts law, a special election must be held 145 to 160 days after a Senate seat becomes vacant. The winner of that election would serve the remainder of a senator’s unexpired term. 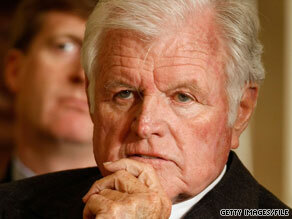 Kennedy, a Democratic senator who has represented Massachusetts for nearly 47 years, was re-elected in November 2006. His six-year term ends in January 2013. In a letter to Massachusetts Gov. Deval Patrick and other state leaders, Kennedy said he supports the current law, “[b]ut I also believe it is vital for this Commonwealth to have two voices speaking for the needs of its citizens and two votes in the Senate during the approximately five months between a vacancy and an election.” Kennedy asks the governor and state leaders to “amend the law through the normal legislative process to provide for a temporary gubernatorial appointment until the special election occurs,” according to the letter, dated July 2. Read the letter (pdf) Democrats, in collaboration with Sen. Joseph Lieberman, a Connecticut independent, control 60 votes in the Senate and face a tough battle this fall to overhaul health care. They have been trying to calculate votes without Kennedy, who has been unable to attend many sessions for months due to his illness. Kennedy has championed universal health care for years and wants to make sure Democrats have the votes they may need for passage of a comprehensive bill. He has called the issue “the cause of his life.” At the 2008 Democratic Convention, he said he wants to see legislation that will “guarantee that every American … will have decent, quality health care as a fundamental right.” Kennedy is the second longest-serving member of the Senate, surpassed only by Democrat Robert Byrd of West Virginia. Calculations on Senate votes this fall also have included Byrd, who is 91.